3 Bedroom house in Panama City Beach - Paradise Home, Luxury Beach Home with PRIVATE POOL+Game Rm/Garage+Fenced Yard. Paradise Home, Luxury Beach Home with PRIVATE POOL+Game Rm/Garage+Fenced Yard. Vacation in a Piece of Paradise! Wow! Take a look at this wonderful home. This home was updated in 2015! If you are looking for a home in the heart of Panama City Beach you will want to stay at this home! This home is in a nice safe and quiet family area. Approx 3-4 minutes to the Beach (1.5 Miles)! Less than a mile to many attractions like: Zoo World, Ripleys Belief It or Not, Wonderworks, Go Carts, Miniature Golfing, Bungee Sling Shot Rides, Video Arcades, Full Size Human Maze, Restaurants, Pizza + much more. 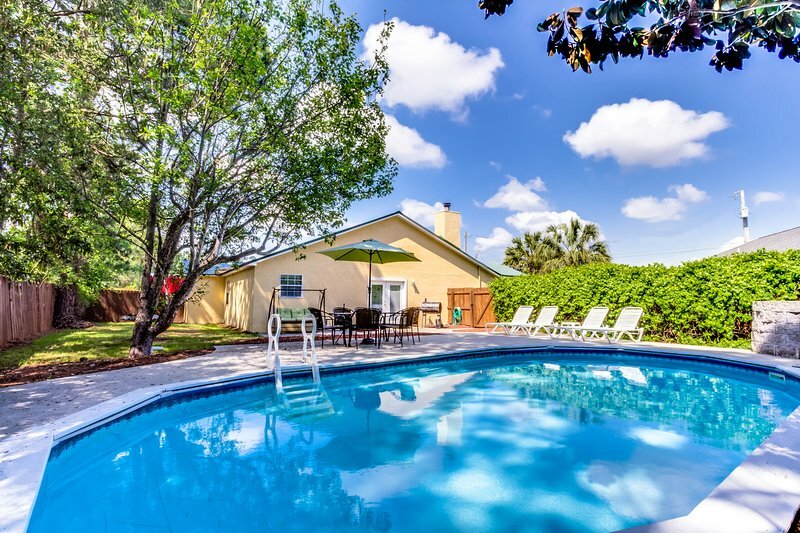 When you stay at this home you will have your own Private Inground Swimming Pool and a completely fenced back yard with a full 6' Privacy Fence! You will be able to enjoy the converted 2 car garage / Private Game Room! In your game room you will be able to play a games on your own Pool Table, Arcade Size Air Hockey Table & Ping Pong Table / Tennis Table! Relax and read a book in your HAMMOCK in your own back yard next to the pool or Watch a movie on the New 42' TV mounted above your Fireplace! Great Home with an excellent location at Panama City Beach: Location, Location, Location! Close to everything but just far enough away for peace and quiet. You can walk to many places less than a mile from this home. Pier Park & Frank Brown Park Community Center are close by, approx 8-9 minutes or so from this home! This is probably the Best Value at Panama City Beach with all that this home has to offer. Key Points of this home: Location (Centally Located),Private In Ground Pool, Private Game Room, 42' LCD TV in Living Room, Year Round Electric Fireplace (has a no heat mode, so you can enjoy the look without the heat), Private Fenced Yard, Quiet & Safe Neighborhood, Large King Bedroom with Wal In Closet, Additional Parking if needed for a boat or trailer, Garage if needed can be used to park 1 car or several motorcycles (with the game table moved to one side). Great Price!!! Bike Rentals, Surf Board & Metal Detector Rentals! : Bike Rentals: Yes, you can get some exercise and save fuel! Rent our beach cruiser style bikes. These are bikes with large tires and handle bars that will keep you seated upright. The bikes come complete with locks. Surf Board Rentals: Catch some waves with our 6' fiberglass Ron Jon Surf Board! You will look like a local when you show up at the beach with this full size surf board! Have a great time catching some waves or just paddling along the beach in style! Metal Detector Rental: Find some lost treasures at the beach with our Metal Detector! Make some extra cash, get some exercise or just keep the kids busy. This is a full size metal detector with digital display. Boat Rentals! : Do you like to fish! If you really want to take your vacation to the next level. Rent one of our electric boats for your stay. The boat will be docked at Lullwater Lake on the West end of Panama City Beach near Pier Park. Lullwater Lake is approx 40 Acres in size. This is the Largest Freshwater on Panama City Beach! There are Large Mouth Bass, Sunfish, Catfish and other varieties of fish in this lake. You will get use of an Aluminum Boat, Electric Motor, Battery, Battery Charger & Life Vest. Just bring your fishing poles & tackle. You will have 24 access to your boat & and access to charge the battery. What a nice package! Rent one of our paddle boats. The paddle boat is available for use on Lullwater Lake. 24 Hour Access to your paddle boat rental. We thoroughly enjoyed our visit at this house! From morning coffee by the pool to quick trips to the beach to dinners in the beautiful kitchen to cozy evenings in the huge sectional in the living room. We will definitely book this house again. We stayed a week and enjoyed every minute! The house was everything we wanted! We will.definitely do.it again. This Panama City Beach home was perfect for the 4th of July week. Our party of 8 fit comfortably in this home, and we were only a block from the beach. Numerous restaurants, shops and activities were at our fingertips. All ages would love this location as there is something for everyone. The home had a nice pool/lanai and we could even bring our pets! The beach is the nicest, powdery white sand that always stays cool. Fireworks were AMAZING on the beach for the 4th; best I've seen in my life. The owner of this home takes a lot of pride and concern in making sure her guests are pleased and happy while staying here. Rita - the housekeeper was WONDERFUL and did such an amazing job to help us with our concerns or questions. We can't say enough great things about Rita; she really made it a pleasurable experience. One of our nicest vacations yet, and we travel several times a year and rent homes all over the FL area. If you have teenagers or even kids in their 20's, they would really love it here. Not many places have something for all ages and this home and location are perfect! Owner's reply: This is the PERFECT Home for Families, especially close to the HUGE fireworks Celebration at Pier Park! We had a great time in Panama City Beach! The home was perfect for our stay. The Kids loved the game tables that were in the garage. Everyone enjoyed the Swimming Pool and the Back Yard is very private. We will definately stay here again!!! The home is close to everything and yet it is very quiet and private! Love It! Becky (Nashville, TN). Estimated price per night based on a weekly stay. Owner fees of $169.00 per stay may apply. Enter your dates to see the total cost.